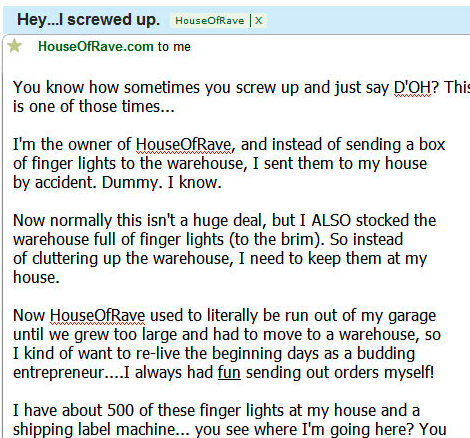 To make money, I once ran a small website that sold rave products. The website got about 10 orders per day, and made enough to help pay for college and stash some money into a savings account. The extent of my marketing was sending out an email newsletter to all my previous customers. It was full of pretty pictures and giant “buy” buttons. I made them myself and thought I was a genius. Damn that’s a lot of photos!These loonnggg and difficult to make emails weren’t working. So I started picking up some books on what’s known as “copywriting”. Copywriting is basically the science of putting words together in a way … that makes people buy stuff. I studied this “copywriting” stuff furiously for months … and I became obsessed. So with a little help from a friend, I tried an experiment: I was going to hold a sale on these things called Finger Lights. They were little lights that wrapped around your finger. 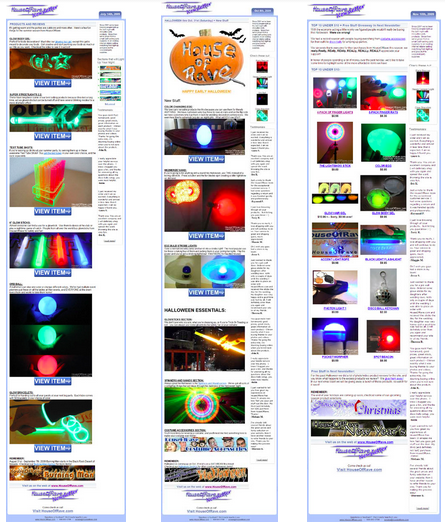 Normally I would just smack a giant picture of the finger lights on an email, send it out, and pray that they sell. After studying copywriting … I realized this was the completely wrong approach! People didn’t really know WHY they should buy finger lights, so why would they? They probably just thought they’re for kids at a rave party to wave around on a dance floor. Not a single “pretty picture” on it. It was the complete opposite of what I was doing before. After sending this email out on a Friday night at 9pm … the next day I had over 120 orders. For a site that normally only got 10 orders per day, this was 1200% better, whoa! The difference in this email was putting the words in a way that sold. I started doing copywriting for my own business, for AppSumo, for other people’s businesses … and then started teaching other people on how to write copy. I want to save you the hours of valuable time I spent learning copy myself. It’s a 17-page PDF file that takes all the principles of writing high-converting copy and packs it into one easy-to-read checklist. I’ve spent years of my time experimenting and slowly learning how to write copy that sells. In the end, it has brought me and the businesses I’ve worked with (like AppSumo) tons of more money. With the Kopywriting checklist, you can learn how to write better copy in one reading session. It’s like the Cliff’s Notes version of a copywriters education. And we’re giving it to you … for only $10. The BEST use for the Kopywriting Checklist is to skim through it each time you sit down to write copy. Even if you’re a good writer, this will surely churn your brain with ideas. If you want an easy-to-follow guide to help you every time you sit down to write copy, this is for you. For only $10, you can start writing copy that converts higher and gets you more sales. Just by getting a tiny-bit better with your copywriting, you will earn back the cost of this guide damn-near immediately. I ordered a glass of wine at a restaurant yesterday that cost me $12, and it did NOTHING for me. With the Kopywriting Checklist, you can spend just $10 and get knowledge that will help you forever. Click here and grab the Kopywriting Checklist now!